Like many young people who go away from home to college and university, the experience is all about exposure to new ideas. One becomes more “worldly” in a sense as you have a chance to spend time with other people; you can experience knowledge of other cultures and you can even be exposed to other worldviews. Hinduism was the fascinating worldview during my sophomore year. I had taken an intro to literature class where my professor was intent on sharing with his students the peace we could find with this [to me] strange new religion. We had an in-depth study on the writing by Herman Hesse. The book we focused on was Siddhartha. I was fascinated by the book, the main character’s search for self-knowledge and spirituality. He was victimized over and over by two forces in his search, the forces of good and evil. I remember relating to his search on some level but as time went on I could not understand the true direction of Siddhartha’s life. It seemed as if evil had an important part to play in his life, and it played a part that was as important as good. This small exposure to Hinduism just did not satisfy me as I began to think deeply about where I wanted my life to go. We all have this good versus evil thing going on, don’t we? What do we do with our “inner struggle?” How do we handle the fact that we have two natures at work within us as we try to live our lives? 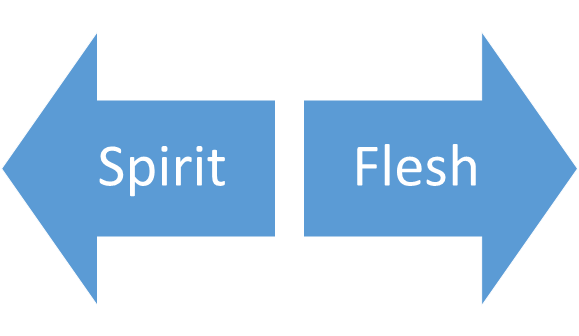 When I gave my life to Christ, I was naïve about my two natures. I thought that the evil would go away as I made my sincere commitment. I had expressions that I used before I knew Jesus and they did not go away. I had habits that needed to go away but they hung on. I had temptations that led me to dark places and those temptations were still there. Evil is trying to fight against the good you have experienced in your exposure to Jesus Christ. Two natures within us, both struggling for mastery. There was a big difference in this struggle however; I knew that I should be living a life in Christ. I should be trying to be a good person. Unlike Siddhartha, I wanted good to win out. I wanted as much evil out of my life as possible. Graham says awareness of the struggle is something to be thankful for even though at times it can be confusing, maddening and when evil wins out, it is discouraging. “It is evidence that the Holy Spirit has come into your life, illuminating the darkness of sin, sensitizing your conscience to sin, awakening in you a new desire to be clean and free from sin before God” [Graham, 93]. Before I knew Jesus, I did not even think that many of the things I was doing were wrong, but they were. When I became a “new person” everything took on a new point of view. The long journey began, the journey of a life in Christ that hopefully will culminate in my glorification, my time to be with God. But along the way is the struggle; the need to die to my sin nature every day. Like many of you, I am faced with the daily choice of what to feed my spiritual life. Graham says that this is one of the most important daily choices that we have to make. If we feed ourselves material that will support our efforts to live a Christ-like life, the Holy Spirit will support us, empower us. If we starve our spirit and instead feed ourselves material from the old sinful nature, our flesh will dominate. The struggle is real and it is not easy, but this is the worldview that works for me.